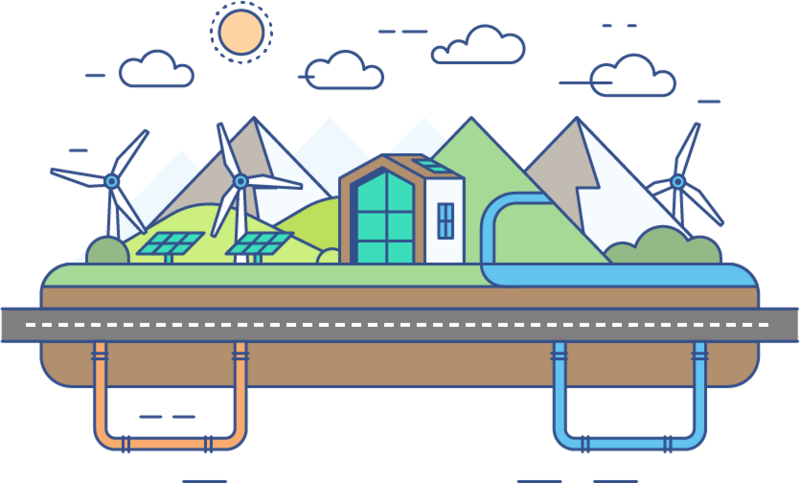 In addition to traditional geothermal and renewable energy systems, we are pioneers in the installation of a new geothermal probe technology that unites the advantages of open loop systems and closed loop systems. Aerothermy is a low-investment renewable energy source that can be used to produce domestic hot water and also for heating and air conditioning of homes or enclosed spaces. Because of its simplicity and low cost, it is the most viable option in many projects. The thermal applications of the biomass can be carried out mainly through boilers, stoves or chimneys. It is possible to take advantage of the thermal energy that vegetable fuels store with a zero balance of emissions and a lower cost than fossil fuels. The integration of human activity in the environment has biomass with a great ally. The possibilities of application of photovoltaic solar energy are immense and range from the most simple applications such as calculators and sundials, to the most complex such as large power generation plants or power systems for artificial satellites, it is possible to integrate photovoltaic energy into renewable systems such as geothermal. NEW THERMAL LONGUE LAUNCH "THERMAL DELUXE". Elegant and ergonimic design, made with noble woods, trated by high frecuency to ensure durability, potimum and stability of the curves, supported on steel base. DCL Geoenergia was born under the premise of sustainability, respect for the environment and the fight against climate change, a paramount concern on which the ITECON group has supported all its projects to this day. As a partner of the CLIMATE KIC community, a European community of innovation and knowledge, our organisation has been commited for years to the fight against climate change. Our goal is the search of the net balance, which means achieving as a goal the zero energy demand for buildings in short term. Geothermal Energy is energy stored in the form of heat below the surface of the earth. It is an inexhaustible source of energy, available 365 days a year, 24 hours a day and, unlike other systems, it is not affected by weather conditions (sun, wind, etc). Aerothermal energy is a low-investment renewable energy source that can be used to produce domestic hot water and also for heating and air conditioning of any kind of building. Because of its simplicity and low cost, it is the most viable option in many projects. The thermal applications of the biomass can be carried out mainly through boilers, stoves or furnaces. It is possible to take advantage of the thermal energy that vegetable fuels store with a zero balance of emissions and a lower cost than fossil fuels. The integration of human activity in the environment counts upon the biomass as an great ally. The possibilities of application of photovoltaic solar energy are immense and range from the most simple applications such as calculators and solar watches, to the more complex ones such as large power generation plants or power systems for artificial satellites. It is possible to integrate photovoltaic energy in renewable systems such as geothermal energy. The energy certification qualifies a building energy by calculating the annual energy consumption needed to meet the energy demand of a building under normal conditions of occupation and operation. 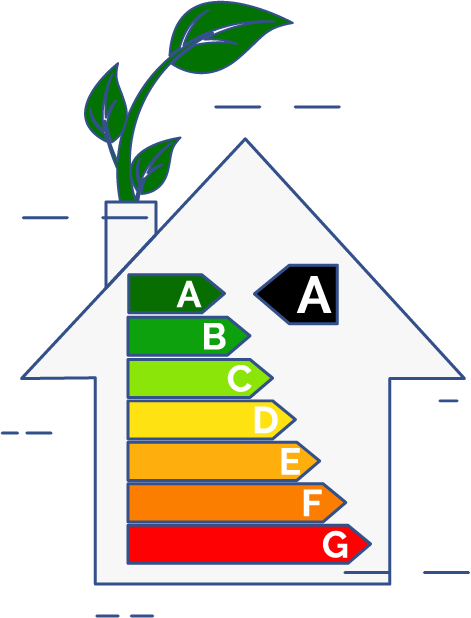 The energy certificate describes the efficiency in terms of energy consumption. Through an energy audit we obtain a reliable knowledge of energy consumption and viable proposals to improve the building services' energy demand. The audit establishes a monitoring plan in order to control the evolution. | Legal warning | Cookies policy | Copyright © 2018, All rights reserved. Legal warning | Cookies policy | Copyright © 2018, All rights reserved.